Just in time for the holidays Apple have reintroduced the ability to gift from one Apple user to another. You can do this from within iTunes but did you know you could also do this on your iOS device? Here’s how you do just that. 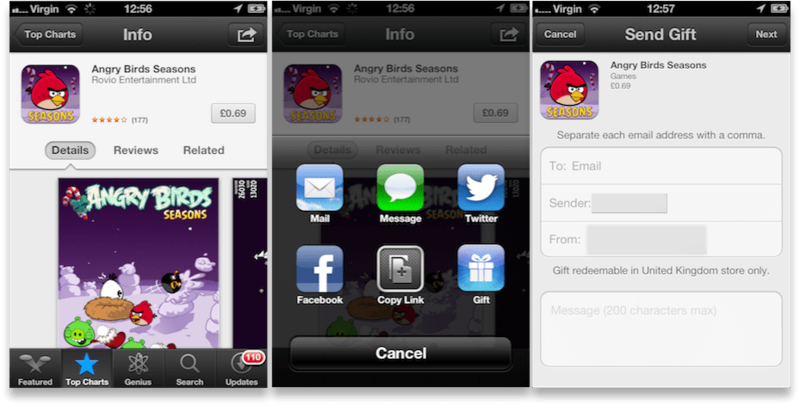 To start the giftgiving process first of all launch the App Store within your iOS device. Choose an app that costs at least 99p. Enter your name, email address and the email address of the person you want to gift to. Choose to send it straight away or to schedule it for a certain date. and it’s as simple as that. There are a couple of caveats the main one being that you cannot gift something from a USA only store or UK store to someone with an iTunes account outside of those areas. Here’s how you give them up from the iTunes Store using your Computer. Open the iTunes Store (in the upper right hand corner), and choose the App Store. Find the app you want to give, then click the arrow near the buy button, and select the Gift this App option. You can choose between printing the gift, or sending it via email. Choose your option, fill out the info, and click Continue. Enter your iTunes password when prompted, enter a message if desired, and click Buy Gift. And there you have it. The ability to schedule a gift for a certain they is something I know i’ll be using quite regularly. Next Next post: BBC News : Why Android is Hardwork And Why Apps Come To iPhone First.